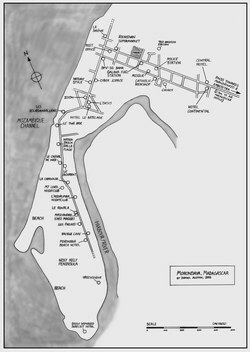 A street plan of Morondava on the west coast of Madagascar marking places of interest to visitors. 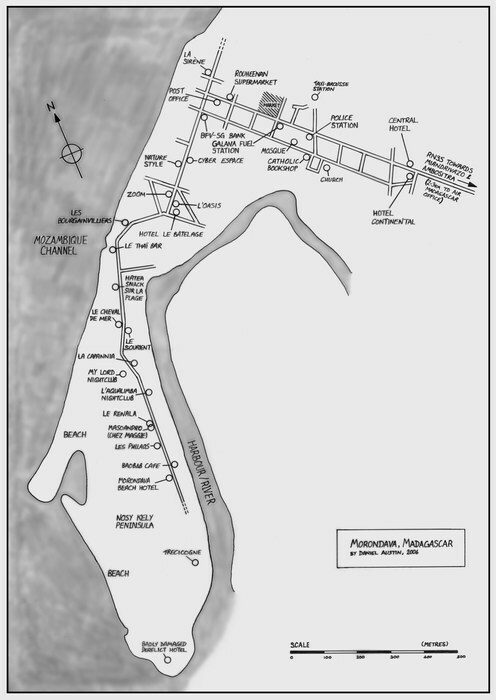 Compiled from information gathered in Morondava by Daniel Austin in January 2006. Hotels: Central Hotel, Hotel Continental, L'Oasis, Zoom, Hotel Le Batelage, Les Bourgainvilliers, Le Cheval de Mer, Le Renala, Masoandro (Chez Maggie), Les Philaos, Baobab Cafe, Morondava Beach Hotel, and Trecicogne. Bars and Restaurants: La Sir�ne, Le Tha� Bar, Hatea Snack sur la Plage, Le Sourient, and La Capannia. Shops: Rouheenan Supermarket, Catholic Bookshop, and Nature Style. Nightclubs: My Lord and L'Aqualimba. Other Places: Police Station, Church, Mosque, Post Office, BFV-SG Bank, Galana Fuel Station, and the Taxi-Brousse Station. The distance to the Air Madagascar Office (off the map) is also indicated.